Sodium chloride, also known as common salt or table salt, is a chemical compound with the formula NaCl. Its mineral form is called halite. It is highly soluble in water and is the salt most responsible for the salinity of the ocean and of the extracellular fluid of many multicellular organisms. As the main ingredient in edible salt, it has long been used as a food seasoning and preservative. In its latter capacity, it reduced human dependence on the seasonal availability of food and allowed travel over long distances. In this manner, it served as a foundation for the spread of civilization. It is currently available quite inexpensively and in large quantities. Historically, however, it was difficult to obtain and was a highly valued trade item. Until the 1900s, it was one of the prime movers of national economies and wars. It was controlled by governments and taxed as far back as the twentieth century B.C.E. in China. During his protests in India, Gandhi led the famous salt march to challenge the British-imposed monopoly on salt. There are 35 references (verses) to salt in the Bible (King James Version), the most familiar probably being the story of Lot's wife, who was turned into a pillar of salt when she disobeyed the angels and looked back at the wicked city of Sodom (Genesis 19:26). In the Sermon on the Mount, Jesus also referred to his followers as the "salt of the earth." The apostle Paul also encouraged Christians to "let your conversation be always full of grace, seasoned with salt" (Colossians 4:6) so that when others enquire about their beliefs, the Christian's answer generates a 'thirst' to know more about Christ. Historically, there have been two main sources for common salt: sea water and rock salt. Rock salt occurs in vast beds of sedimentary evaporite minerals that result from the drying up of enclosed lakes, playas, and seas. Salt beds may be up to 350 meters (meters) thick and underlie broad areas. In the United States and Canada extensive underground beds extend from the Appalachian basin of western New York through parts of Ontario and under much of the Michigan basin. Other deposits are in Ohio, Kansas, New Mexico, Nova Scotia, and Saskatchewan. In the United Kingdom underground beds are found in Cheshire and around Droitwich. The mining of rock salt, called halite. 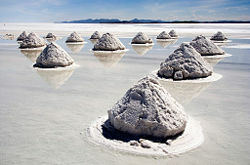 This includes solution mining, in which water is used to dissolve the salt and the brine that reaches the surface is evaporated to recover the salt. In the correct climate (one for which the ratio of evaporation to rainfall is suitably high) it is possible to use solar evaporation of sea water to produce salt. Brine is evaporated in a linked set of ponds until the solution is sufficiently concentrated by the final pond that the salt crystallizes on the pond’s floor. One of the traditional methods of salt production in more temperate climates is using open pans. In an open pan salt works, brine is heated in large, shallow open pans. Earliest examples date back to prehistoric times and the pans were made of ceramics known as briquetage, or lead. Later examples were made from iron. This change coincided with a change from wood to coal for the purpose of heating the brine. Brine would be pumped into the pans, and concentrated by the heat of the fire burning underneath. As crystals of salt formed these would be raked out and more brine added. 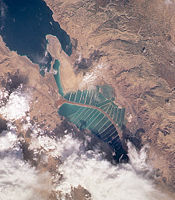 In the second half of the nineteenth century, it became possible to mine salt, which is less expensive than evaporating seawater or extracting salt from brine. Consequently, the price of salt became more reasonable. However, extraction of salt from brine is still heavily used: for example vacuum salt produced by British Salt in Middlewich has 57 percent of the UK market  for salt used in cooking. The crystal structure of sodium chloride. 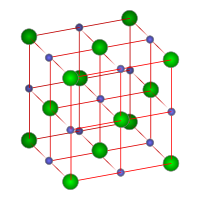 Each atom has six nearest neighbors, with octahedral geometry. Sodium chloride forms crystals with cubic symmetry. In these, the larger chloride ions, shown in the diagram as green spheres, are arranged in a cubic close-packing, while the smaller sodium ions, shown as blue spheres, fill the octahedral gaps between them. The ions are held together with ionic bonds. Each type of ion is surrounded by six ions of the other kind. This same basic structure is found in many other minerals and is known as the halite structure. This arrangement is known as cubic close packed (ccp) crystal system. While most people are familiar with the many uses of salt in cooking, they might be unaware that salt is used in a plethora of applications, from manufacturing pulp and paper to setting dyes in textiles and fabric, to producing soaps and detergents. In most of Canada and the northern United States, large quantities of rock salt are used to help clear highways of ice during winter, although "road salt" loses its melting ability at temperatures below -15 °C to -20 °C (5 °F to -4 °F). Salt is also the raw material used to produce chlorine which itself is required for the production of many modern materials including PVC and pesticides. Sodium metal is produced commercially through the electrolysis of liquid sodium chloride. This is done in an apparatus called a Downs cell, in which sodium chloride is mixed with calcium chloride to lower the melting point below 700 °C. As calcium is more electropositive than sodium, no calcium will be formed at the cathode. This method is less expensive than the earlier method of electrolyzing sodium hydroxide. Salt is commonly used as a flavor enhancer for food and has been identified as one of the basic tastes. Unfortunately, it is often ingested well in excess of the required intake. This leads to elevated levels of blood pressure (hypertension) in some, which in turn is associated with increased risks of heart attack and stroke. Consuming salt in excess can also dehydrate the human body. Many microorganisms cannot live in an overly salty environment: water is drawn out of their cells by osmosis. For this reason salt is used to preserve some foods, such as smoked bacon or fish, and can also be used to detach leeches that have attached themselves to feed. It has also been used to disinfect wounds (although it causes a great deal of pain). In medieval times, salt would be rubbed into household surfaces as a cleansing agent. While salt was once a scarce commodity in history, industrialized production has now made salt plentiful. About 51 percent of the worldwide output of salt is now used to de-ice roads in freezing weather conditions. The salt may be put in grit bins and spread by winter service vehicles. This approach works because salt and water form an eutectic mixture. Under controlled lab conditions, a solution of sodium chloride in water can reduce the freezing temperature of water to -21 °C (-6 °F). In practice, however, sodium chloride can melt ice down to only about -9 °C (15 °F). The salt sold for consumption today is usually not pure sodium chloride. In 1911, magnesium carbonate was first added to salt to make it flow more freely. In 1924, trace amounts of iodine—in the form of sodium iodide, potassium iodide or potassium iodate—were first added, creating iodized salt to reduce the incidence of simple goiter. Salt for de-icing in the UK typically contains sodium hexacyanoferrate (II) at less than 100 parts per million as an anti-caking agent. In recent years this additive has also been used in table salt. Chemicals used in de-icing salts are mostly found to be sodium chloride (NaCl) or calcium chloride (CaCl2). Both are similar and are effective in de-icing roads. When these chemicals are produced, they are mined/made, crushed to fine granules, then treated with an anti-caking agent. Adding salt lowers the freezing point of the water, which allows the liquid to be stable at lower temperatures and allows the ice to melt. Alternative de-icing chemicals have also been used. Chemicals such as calcium magnesium acetate are being produced. These chemicals have few of the negative chemical effects on the environment commonly associated with NaCl and CaCl2. ↑ Solar Salt production. Salt Institute. Retrieved June 22, 2007. ↑ Towards an understanding of open pan salt making. Lion Salt Works History & Heritage. Retrieved June 22, 2007. ↑ Early Salt Making. Lion Salt Works History & Heritage. Retrieved June 22, 2007. ↑ Vacuum Pan Salt Refining. 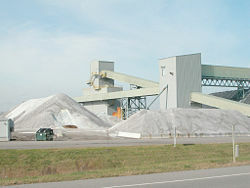 Salt Institute. Retrieved June 22, 2007. ↑ The Competition Commission. Factors affecting rivalry in the relevant market prior to the merger. British Salt Limited and New Cheshire Salt Works Limited: A report on the acquisition by British Salt Limited of New Cheshire Salt Works Limited. Retrieved June 22, 2007. Mineral Gallery. 2006. The Mineral Halite. Amethyst Galleries. Retrieved May 9, 2007. Salt: Statistics and Information. United States Geological Survey. Using Salt and Sand for Winter Road Maintenance. Road Management Journal, U.S. Roads. This page was last modified on 9 October 2015, at 14:31.